â¢In the pot that the gumbo will be cooked, sautÃ© (brown) kielbasa in 2-3 tbsp of olive oil. You want to develop caramelization on the kielbasa/smokies. When done, take it out and set aside. â¢If you are using chicken breasts, cut them into bit size pieces and sprinkle with 1 tbsp of Awaken Savor Cajun Marriage Rub, making sure chicken the is well covered. If you are using chicken legs, season the legs and brown them whole. Put the chicken in 2-3 tbsp of hot olive oil and brown an all sides, Legs do not need to completely cooked, they will finish cooking in the gumbo. When done browning, take it out and set aside. â¢At this point the bottom of the pot has developed brown goodness (frond), add some oil if needed (1-2 tbsp), now sautÃ© onion for 1-2 minutes, add garlic (1 minute), then add pepper, carrot, and celery with 1 tbsp of Awaken Savor Cajun Marriage Rub. SautÃ© the vegetables for 3-5 minutes. â¢As the veggies give out water, deglaze the pan by scraping the bottom of the pan and mix any brown bits until they dissolve. â¢Add chicken and beef stock, tomatoes, okra, chicken, and kielbasa. If you like more spice, add a tbsp of Awaken Savor Cajun Marriage Rub. On low heat, simmer until chicken is done, meat should easily separate from the bones. â¢If you used chicken legs: take out all the chicken, and debone the meat, cut into small pieces, and return the meat to the gumbo. â¢Add shrimp, mix everything well, and cook until shrimp is opaque, about 2-3 minutes. â¢Serve on white rice, top with fresh parsley. This sounds delicious! 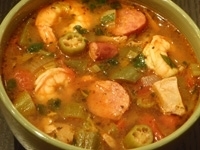 I've never tried gumbo before, but I will definately try this one! I've never had the pleasure of eating Polish cuisine. This dish looks and sounds delicious. Thanks Alicja! 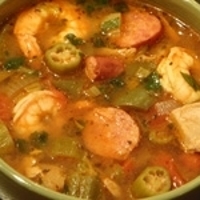 Great Gumbo Recipe! Did receive your Zaatar variations! Thanks,,, Savoring it now! Akram - Thyme of Essence! Please do, and thank you for connecting. This recipe makes a lot, but it is even better the following day, great leftover or ready lunch for next day or two.